QUIET, LOVELY, IMMACULATE APT WITH PRIVATE ENTRANCE from the street. All this in a convenient location a 2 minute walk from the 2/3 express subway line putting all of NYC at your doorstep! Come home to a peaceful refuge in a vibrant community after a busy day in the hustle and bustle of NYC. PLEASE NOTE: Starting in January 2019, we will only be able to accomodate guests for stays of 30 days or more! Please call us if you have any questions regarding this. We are happy to have this 1BR apartment available in our 2 family brownstone to offer to NYC visitors here for stays of 30 days or more. Enjoy the comfort of a home away from home with a fully furnished apartment with up-to-date, clutter-free, stylish furnishings. The apartment sleeps up to 4 adults on a Queen size bed with luxury Serta Beautyrest pillow-top mattress in the bedroom and brand new luxe Italian queen size sleeper sofa in the living room with 5.5” foam mattress (photos of the new sofa are forthcoming). We also have a top-rated Queen air mattress available in the apartment, the SoundAsleep CloudNine Series with Dual Smart Pump Technology which continuously and silently runs in the background providing a firm mattress all night long. This gives renters options in case they do not want to share a bed. See Amenities section for more information on what else is provided in the apartment. Maps, guidebooks and a list of our favorite NYC spots are available in the apartment but feel free to ask us for any personalized recommendations. 1. We live on the property. While the apartment is a separate unit with a private entrance, we live upstairs. If you have any questions, concerns or issues, we can address it right away and most of the time, in person. 2. We provide all of our guests with an information binder with valuable neighborhood and NYC information and can assist with any requests they may have. 3. We love to travel and know what is important to our guests. We professionally clean our apartment between guests and make sure everything possible is provided for our guests comfort. We hope you will enjoy our city and apartment! Dining and Shopping : We are located in a prime area of central Harlem on West 127 St. between 5th & Lenox Avenues just 2 short blocks from the 125 St. retail/business district. Famous Sylvia’s soul food restaurant is literally around the corner. Down the block is one of the hottest restaurants in NYC, Red Rooster, owned by celebrity chef Marcus Samuelson and the venue for President Obama’s fundraisers. Corner Social, a casual bar & restaurant features a lively atmosphere. The newest restaurant options are Cantina for Mexican, Babbalucci and Sotto Casa, two delicious brick oven pizza restaurants, Yuzu, a traditional sushi restaurant and Sushi Inoue (recently awarded a Michelin star) where it's all about the delicious, fresh fish! If a sit down dinner is not an option, there are endless choices including the many local delis or Soul Food Buffet & Salad Bars. For those of you that want to prepare your own meals, Whole Foods just opened 2 blocks away and Olive Market, a gourmet market and Pioneer Supermarket are only 3 blocks away. Retail shopping on 125 St. includes Marshall’s, TJ Maxx & Burlington Coat Factory (Designer/Brand name discounters) , H&M, DSW Shoe Outlet, Old Navy, American Apparel, Banana Republic & Gap Outlets, Bed/Bath & Beyond, & Modell's or House of Hoops (Sporting Goods). - Ginny's Supper Club and Jazz clubs such as Showman's, Londel's, Cotton Club & the newly opened Minton's. - Shrine, world music venue, offers live music every day of the week. - The Maysles Independent Cinema is the only independent film house north of Lincoln Center dedicated to the exclusive exhibition of documentary films. We are both project managers in the financial industry and moved to Harlem over 10 years ago most recently from the Upper East Side. One of us was born and raised in NYC and the other has lived in NYC for the last 20 years and we couldn't imagine living any place else! We love traveling, reading, gardening, running, skiing, tennis, good food & wine and enjoying all NYC has to offer! We have lived here for over 10 years and this is the first neighborhood in NYC that feels like a true community to us. We are happy that the area has changed for the better and pleased that our guest have had positive experiences in their visits! 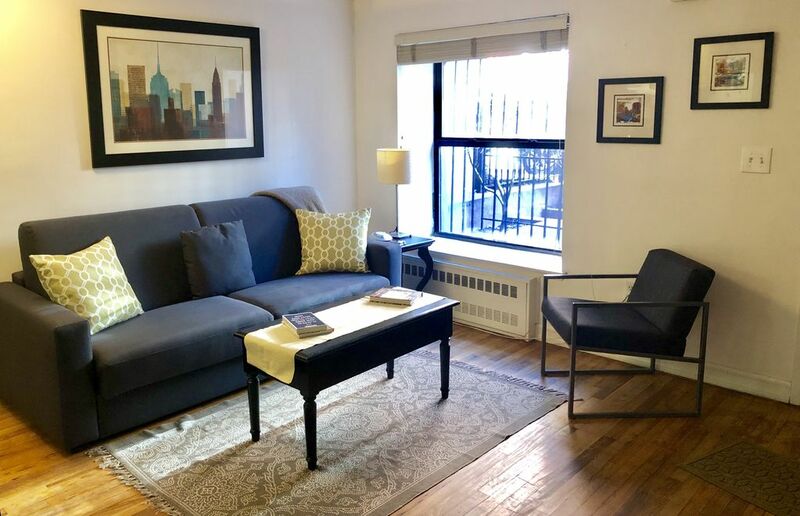 Quiet, immaculate apartment on a beautiful block of brownstones in a friendly, convenient and newly trendy neighborhood is yours to enjoy like a New Yorker. We love NYC and love to travel as “locals” ourselves which allows us to anticipate the needs of our guests to make their stay as memorable and comfortable as possible. Hablo español! Bathtub with multiple spray option shower-head. Bath & hand towels and wash cloths. Hair dryer, shampoo, conditioner, body wash & hand soap. Toilet Tissue provided. In the center of downtown Harlem and 12 minutes by subway to midtown Manhattan. Sheets, blankets, and pillows are provided. There is free street parking on the block but cars must be moved twice per week for street cleaning. A car is not needed nor recommended for transportation within NYC. Bath, hand & face towels are provided as well as kitchen towels. The living room seats 4 comfortably on a sofa and arm chair. There is a 32 inch Flat-screen HDTV with 200+ Cable TV channels including HD & Music channels. Coffee (regular & decaf) filters, sugar, artificial sweetener & non-dairy creamer are provided. A variety of teas, salt & pepper, select condiments, napkins, paper towels, kitchen towels, pot-holder dish soap & sponge are provided in the kitchen. There are also some cleaning supplies. Large & small plates, bowls, cups/mugs, glasses, wine glasses, flatware. Dining table seats 4 and is in the Living/Dining area. Cable service with 275+ channels including HBO, Cinemax, Sports, Spanish & Music channels. There is an outdoor city pool in Marcus Garvey Park 4 blocks away open late June through early September. Umbrellas, stepping stool, broom, dustpan, and Swiffer are available in the apartment. Wonderful apartment with marvelous hosts! This apartment was clean, spacious, and in a great location with access to the metro and Whole Foods. Sandy and Michael were excellent hosts- very welcoming and accessible at all times. We would highly recommend this apartment to those visiting NYC! This was our 2nd time to stay at Michael and Sandy's VRBO property, and we will plan to stay there each time we visit NYC, if it is available. The property is very clean and well-maintained, very spacious and nicely and comfortably furnished, and in a great location. Sandy and Michael are very responsive to all communications, questions, requests, etc. They aren't intrusive at all, but they are available when needed. We have had 2 great stays at this property and look forward to many more. This is our second stay in this great apartment. The apartment is very close to great restaurants, groceries and the subway. The hosts are very accessible and keep the apartment clean, well maintained and homey with everything you need for a stay. We’ll be back. Michael and Sandy are great hosts, who care about the condition of their apartment, are helpful and available should anything go amiss, and welcome you with fruit and wine. The apartment is very convenient to transportation--a short 2 blocks to the subway--and to Whole Foods and a Starbucks if you need a fix. (they also supply coffee in the cabinets) The bedroom, in back, is surprisingly quiet for NYC. In short, this is a fine place to stay, and deserves its ratings. This apt. was great place to get a different perspective of NYC. Great amenities all around and easy subway access for major lines. Michael & Sandy greeted us and made sure we were comfortable. We were unable to make it to Sylvia's for soul food but will include next time. Lenox Saphire had freshly baked goods right across the street! we enjoyed that daily. Apt. was roomy enough for the 2 of us and the owners had a nice bowl of fruit for us to enjoy during our stay. Would recommend this apt. to others for sure. 2/3 subway 2 short blocks away take you to Central Park in 3 minutes & Times Square in 12 minutes! The M1 bus stops on the corner and takes you down beautiful 5th Avenue/Museum mile and along the east side of Central Park. The M60 bus on 125 St. will take you directly to/from La Guardia Airport in 25-30 minutes or Columbia University in 15 minutes. Yankee Stadium & the nearby Gateway Shopping Center are only 20 minutes away. Subway lines 4,5,6,A (to/from JFK), B,C,D & Metro North railroad (10 min to NY Botanical Gardens/Bronx Zoo!) are also nearby. Nearby Harlem Local Attractions: Jazz Clubs, Sunday Gospel Masses (e.g. Abyssinian Baptist Church), Historical Landmarks (Apollo Theatre, Mount Morris Park Landmark District, Striver's Row, Astor Row, Hotel Theresa, Langston Hughes House), Marcus Garvey Park (playground, basketball courts, recreation/fitness center & swimming pool). El Barrio/Spanish Harlem & East River Plaza shopping center nearby on 116 St.
Rates are subject to change until bookings are confirmed. Cancellations must be made by 12 midday CST (Central Standard Time) on the appropriate day. Traveler's Insurance is recommended to protect against last-minute cancellations due to emergencies. See Rental Agreement for full rental terms and conditions.